Welcome to Invigorate! I'm Sarah King. One of my hardest working clients, Jim, and me at a fundraiser for Power for Parkinson's. Whenever someone asks me why I founded Invigorate, they assume someone in my family had Parkinson's and motivated me to commit my career to the disease. I've always been fiercely passionate about helping others achieve the best version of themselves and I believe strongly in the ability of the human body to heal itself given the right tools. 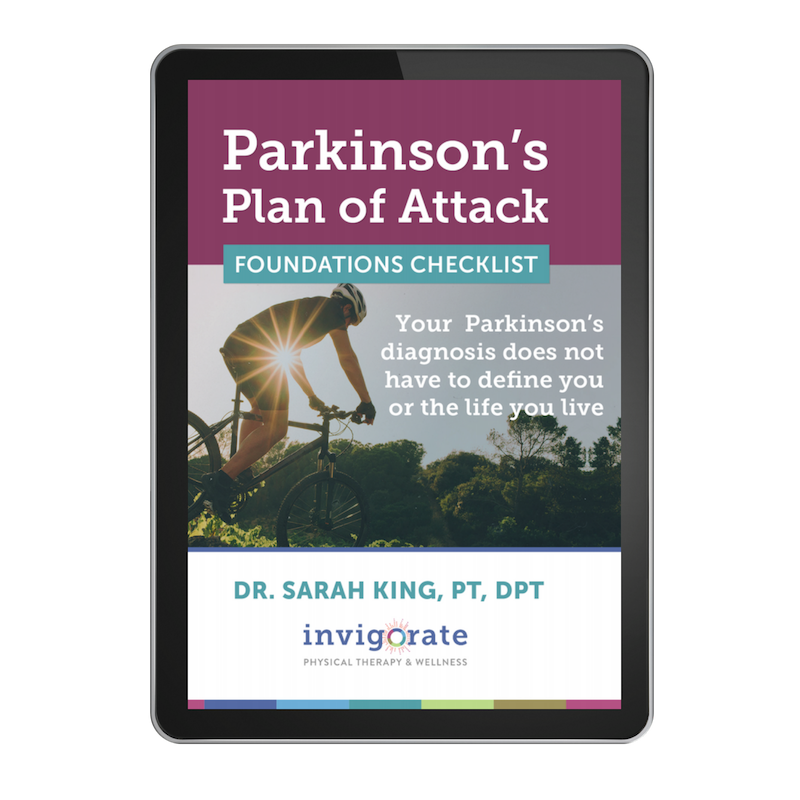 When I saw how powerful the right combination of exercise, nutrition, stress management, and sleep could be on someone with Parkinson's Disease, I was hooked. Within a few weeks of our first session, my first client regained the ability to walk without fear, abolished her low back pain and fatigue, and no longer felt like she was a prisoner inside her own body. She was empowered to take back control of her life which was something I wasn't used to seeing in the traditional healthcare model. I imagined what it would be like to be able to give all people with Parkinson's this feeling of empowerment immediately after they were diagnosed. The idea of preventing the devastating effects of Parkinson's and giving people back the feeling of control over their destiny was so powerful that I couldn't help but pursue it. To this day I wake up every day with that vision in mind. My commitment to you is to be your (ridiculously energized) partner, advocate, and coach. I believe deeply in helping you squeeze the most potential out of your body and your life that is humanly possible. I listen to your story and we work together on a plan that excites and motivates you, adapting it along the way for whatever the future may hold. I've spent more than a decade in health and wellness - first as an ACE Certified Group Fitness Instructor and then an ACSM Certified Personal Trainer. I am a Parkinson's Wellness Recovery (PWR!) trained therapist which is an extension of the LSVT Big and Loud program for people with PD. I served on the Board of Directors as Secretary for the local non-profit Power for Parkinson's, who offers free fitness classes to people with Parkinson’s and their care partners. I'm also a member of the American Physical Therapy Association (APTA) as well as the Texas Physical Therapy Association (TPTA). Originally from Kansas City, my husband, Matt, and I now live in Austin, Texas and have fallen deeply in love with the city's hustle and bustle and outdoor scene. We enjoy hiking the Greenbelt, playing soccer with friends, and searching out the best cup of bulletproof coffee in town. I understand that I do not have a choice whether or not I will have to live my life with Parkinson’s. However, I have many choices on how to deal with this disease. Invigorate is the best choice for me to help me live my life as a champion. Ready to Take Control of Your Future with Parkinson’s?